Not everyone was meant to be a morning person, no matter how hard we try to be, we eventually end up disappointed. We have not even mentioned how the mornings of Mondays are, but, needless to say, they are barely anyone’s favorite time. On the other hand, there are people who are so fond of getting themselves immersed in the sunlight, enjoying the beauty of the day instead of constantly complaining about it. It is funny how people can be that different, but this difference is what makes life joyful, right? We tend to share our different preferences with each other. However, the both teams would love to have something to make their day better from the second they open their eyes; of course, a hot fresh cup of coffee was the first thing to cross your mind and it is absolutely true, but that is not exactly what we are trying to put an emphasis on here; we are referring to those who start their days with a relaxed attitude and get themselves ready for facing their hectic working hours by grooming themselves in front of their special vanities. Well, grooming yourself in front of your vanity is not actually restricted to the time when you are getting ready in the early morning; it could also be during the evening when you are back from your work exhausted and ready to pamper yourself, or even before heading to an important event where you have to beautify yourself right before. All these different reasons lead you to sit in front of your vanity and get ready; all of them share one common ground; the extreme importance of the vanities in every household, right? 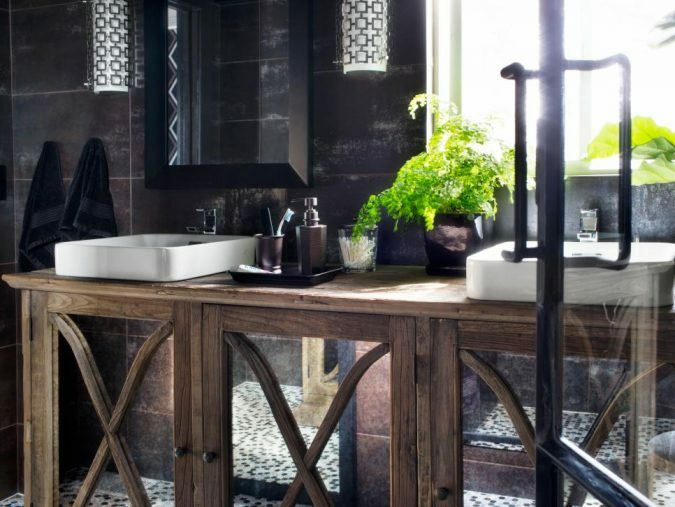 Well, if you are excited to have a new one, but not sure what may be best for your own decoration, check this list of 15 vanity designs and choose whatever suits you. 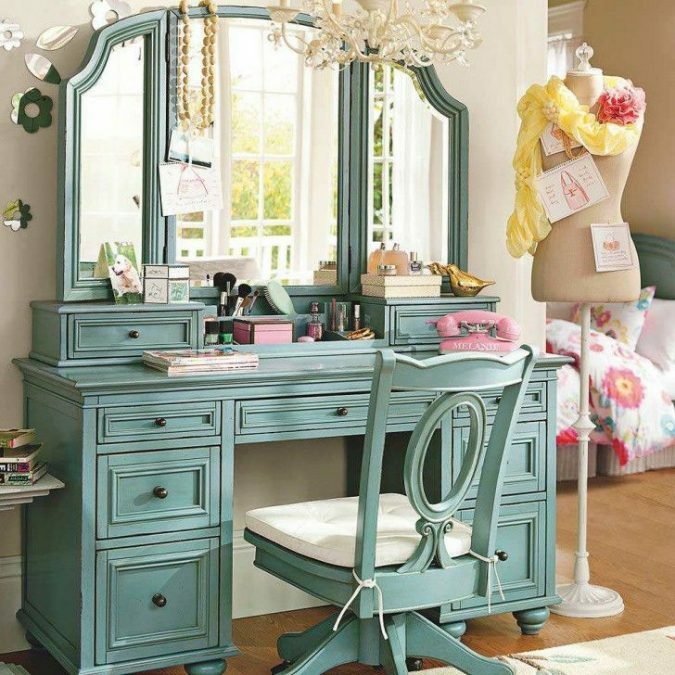 No doubt that your bedroom is the best spot to place a nice lavish vanity table at the corner. 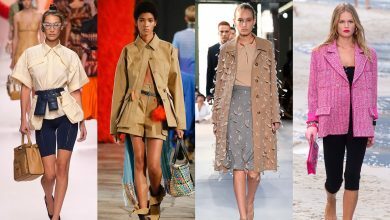 Especially, that you more often than not wear your makeup in your bedroom while getting dressed, so it will be a great idea to have a black one that goes perfectly with whatever the interior design of your room is; besides, it has nice storage drawers where you can keep your makeup kits and important stuff at the reach of your hand. Your bathroom is another perfect place to get yourself ready as well as keep your important stuff together in one place. 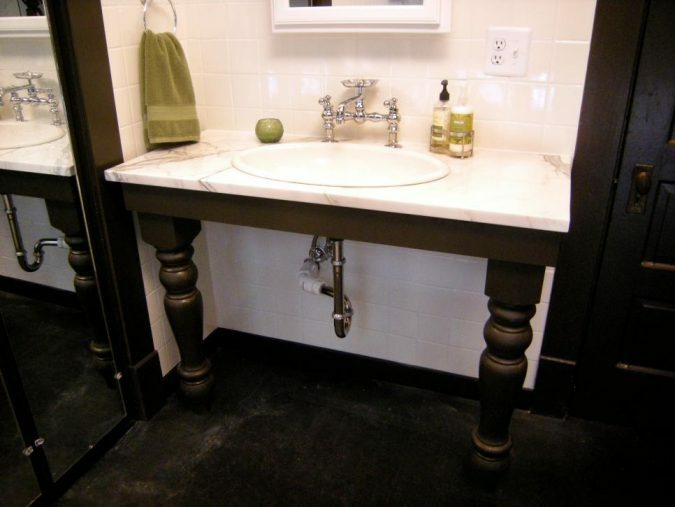 So, it will be a great idea to consider placing a nice vanity in your bathroom. Confused how it should look like? 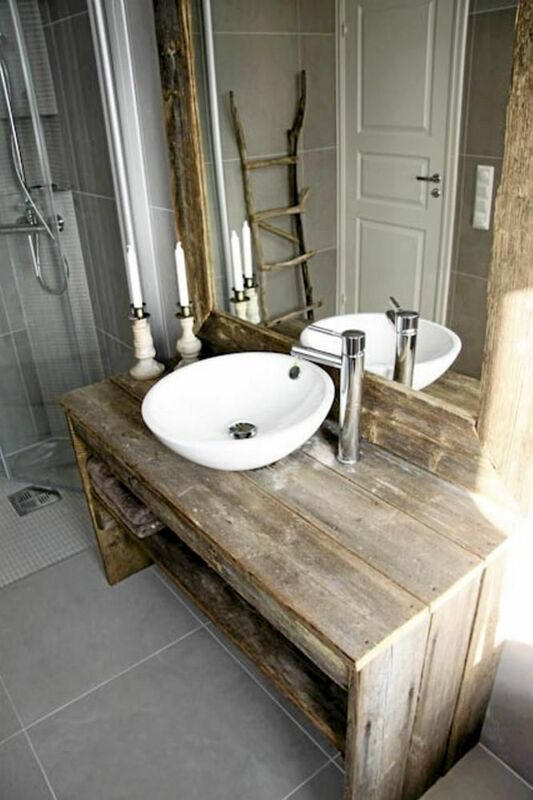 Well, if you are a fan of the countryside theme, you can consider having a rustic butcher block vanity. 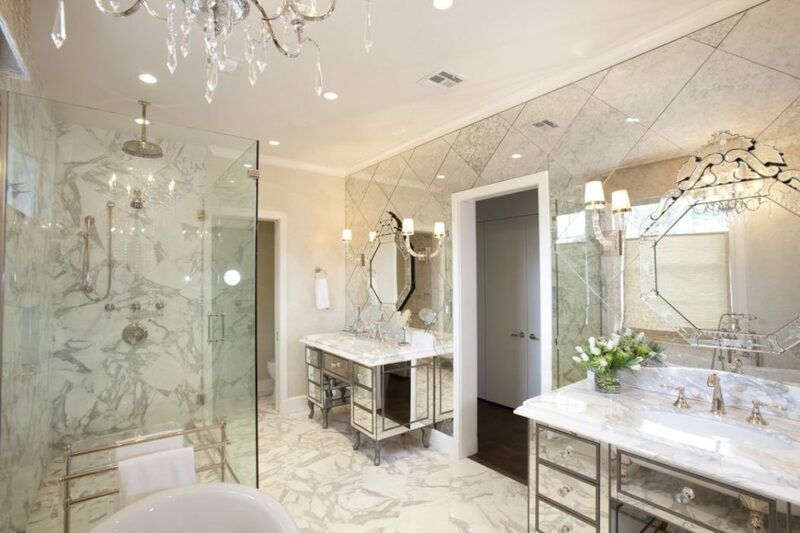 It will give you bathroom a nice look and make it seems larger, especially if yours is relatively small in size. 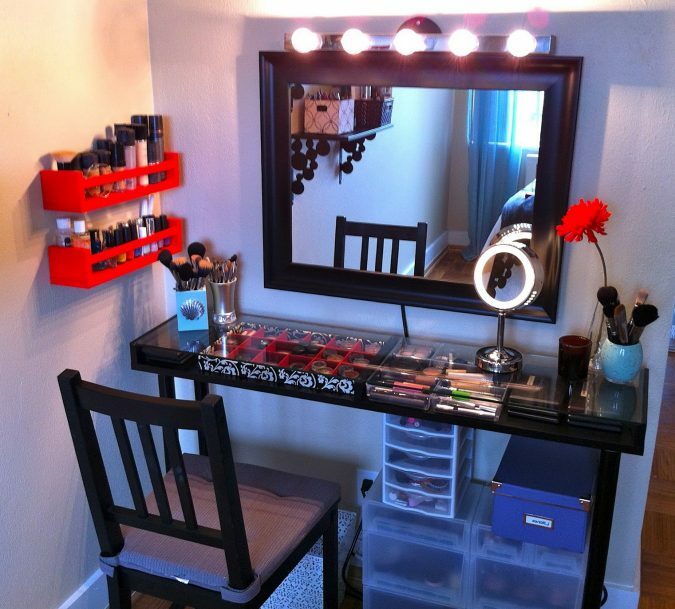 This vanity is so unique; it became very famous on Pinterest and it has gone viral ever since. 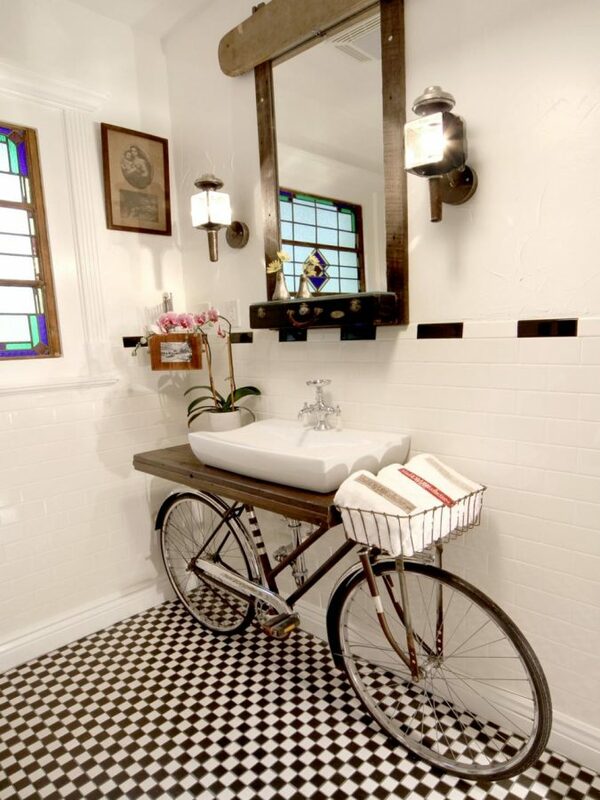 It is also perfect for the bathrooms, especially small ones, for they are a great space saver. If you are going to imitate this inspirational design, do not forget to use solid rubber tires, so your bicycle’s tires do not go flat as the time passes. People who are low on a budget tend to make use of their old stuff instead of spending money on buying new furniture pieces. If you are one of those people, then it is time to take advantage of that old cabinet that you have been neglecting for a long time, leaving it unused and do some makeover to it. Place it in the bathroom and turn it into a double-sink vanity; you can choose to either remove the drawers or keep them, depending on the size of your storage materials. This one is quite easy to DIY; you will just need a corner table to place against the wall and hang a mirror right over it. It is that simple and you can keep things that way, but if you need some storage spaces to keep your stuff then add some mobile storage boxes underneath the table or hang some shelves on the wall. Whatever works for you better, feel free to do it. 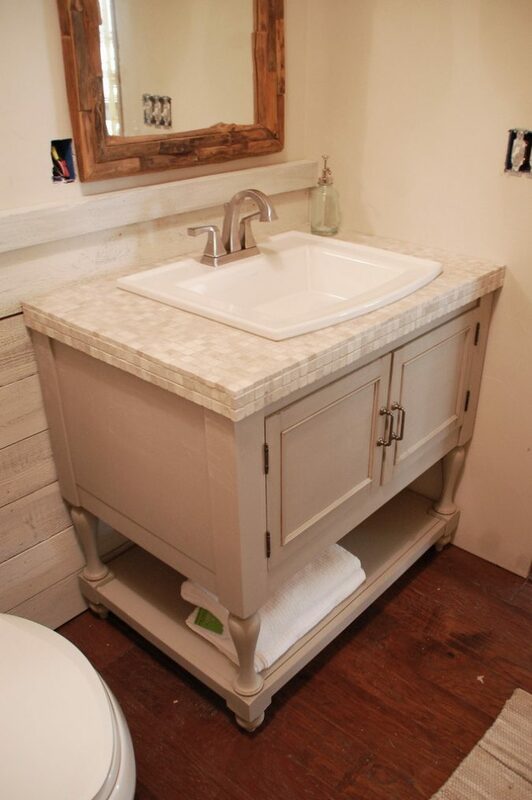 A wooden vanity does not require being purchased, for you can easily create it in the comfort of your own home. You will just need to use scuffle pieces of wood and they will give your bathroom a nice rustic look. You can keep the bottom of the vanity uncovered and use it as storage for towels or you can also use some baskets where you can store your essential stuff; both ways will work perfectly, besides, you will give your bathroom a new look. Do you have a mirrored table? 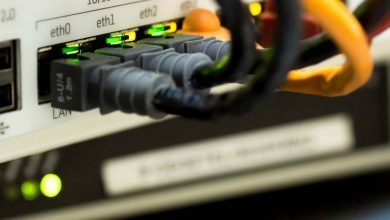 Well, we know it looks perfectly amazing as a dining room modulation, but if you want some change then you can take advantage of it. Still not sure how? Well, you should first relocate it and place in the bathroom and then get some help to get your relocated furniture accommodating with the drainage system. Install the sink to the center of it and, of course, place the mirror right above it. 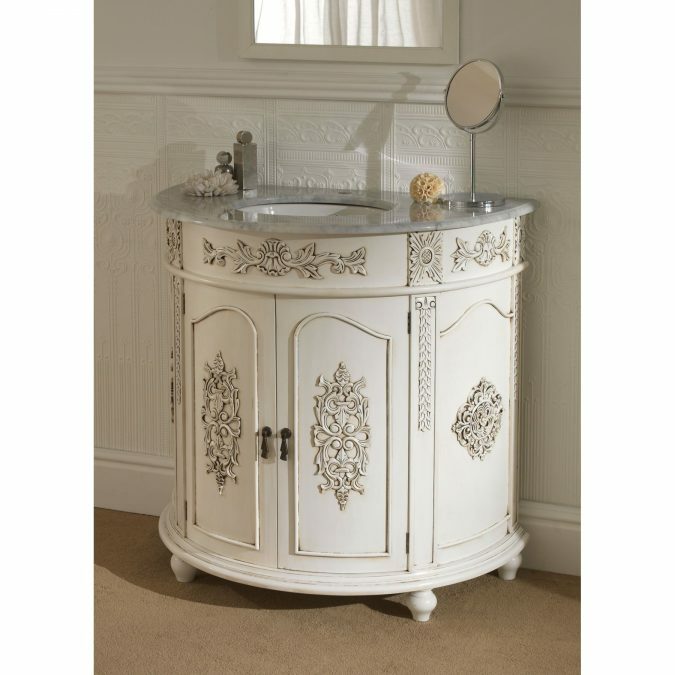 Such vanity design will add a nice touch to your bathroom, making it look vintage and elegant. Is your bathroom too small to have a proper vanity in it? Do not worry, you can actually have one if you just used some smart modifications. 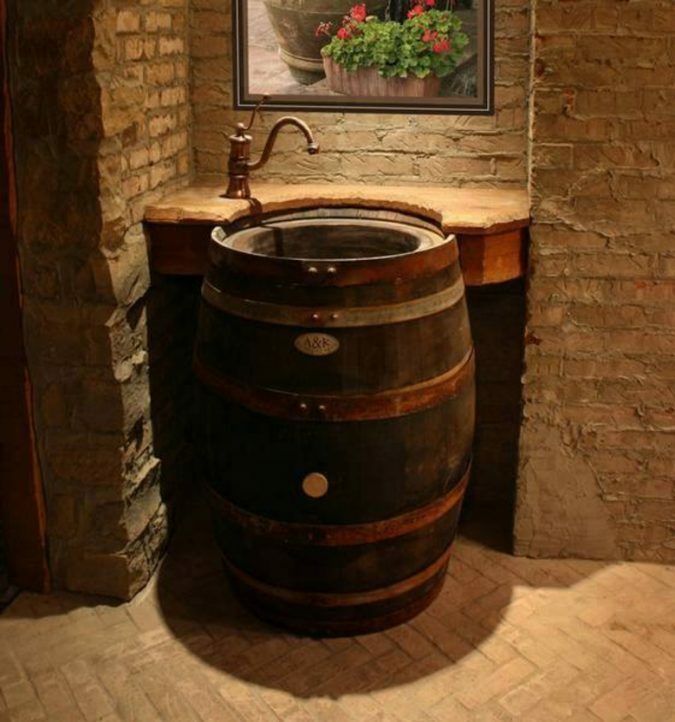 All you need is a small wood table and the help of someone who is able to install a faucet into the wall. 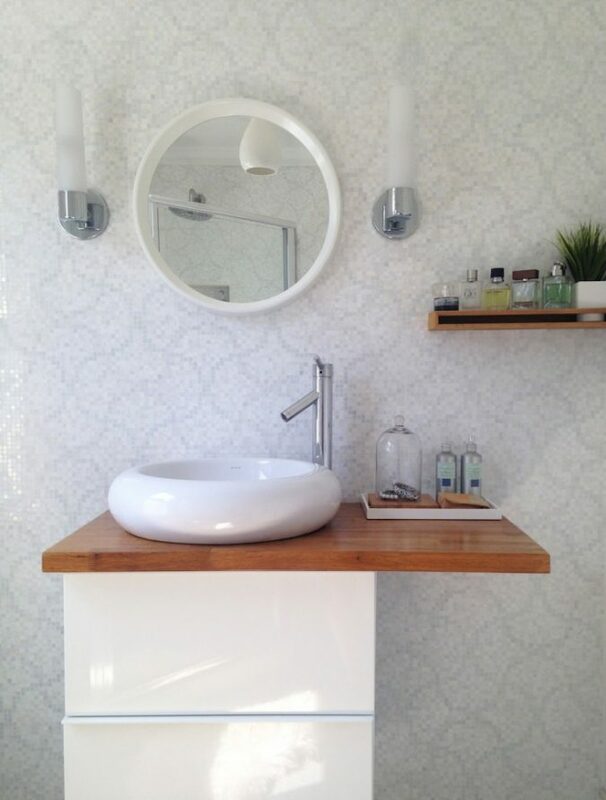 Here you go; a simple, beautiful vanity in your little bathroom. 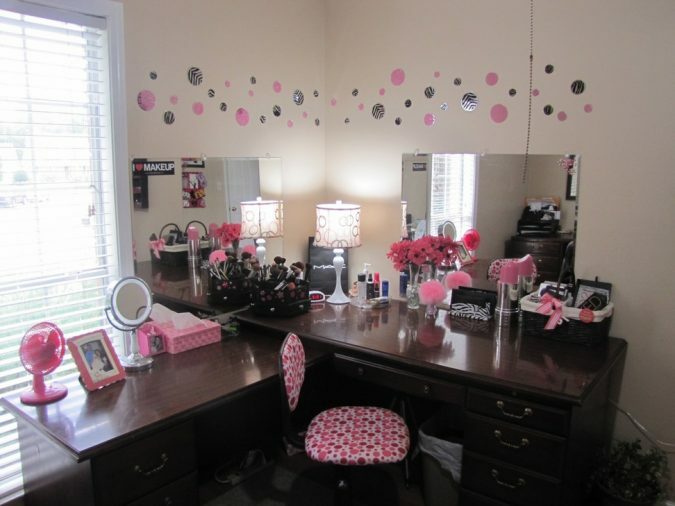 Do you have a nice feminine bedroom that you would love to complete its design by adding a nice lady-like vanity? 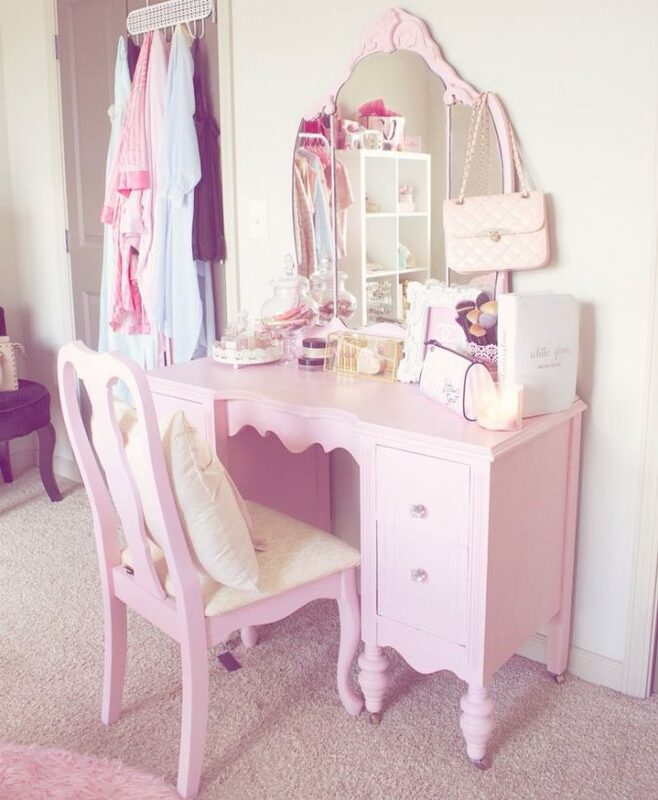 Well, you can purchase a relatively average vanity in size; try to choose one that is pink or purple to add a feminine touch to your room, besides, you do not have to get a large mirror over it, you can just place a proper sized one just at the center of the vanity where you can easily see your face while sitting. Use the storage drawers for keeping your girly stuff as well as your makeup kits in place, so everything becomes easily reachable to you. 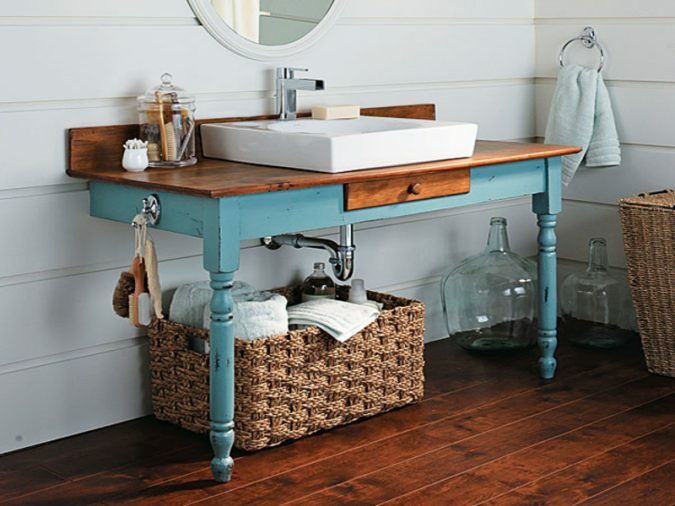 Again, for all the country theme lovers, here is a nice vanity for all of you to put in your bathroom; a pottery barn inspired one. Pottery Barn is quite expensive and not affordable by everyone, thus the DIY projects are there to save us. You can build your own vanity without making it look any cheaper from the one that you could have expensively purchased it. Extraordinary furniture is actually the best to go by when it comes to decorating your own house. So, are you up to some extraordinary ideas? 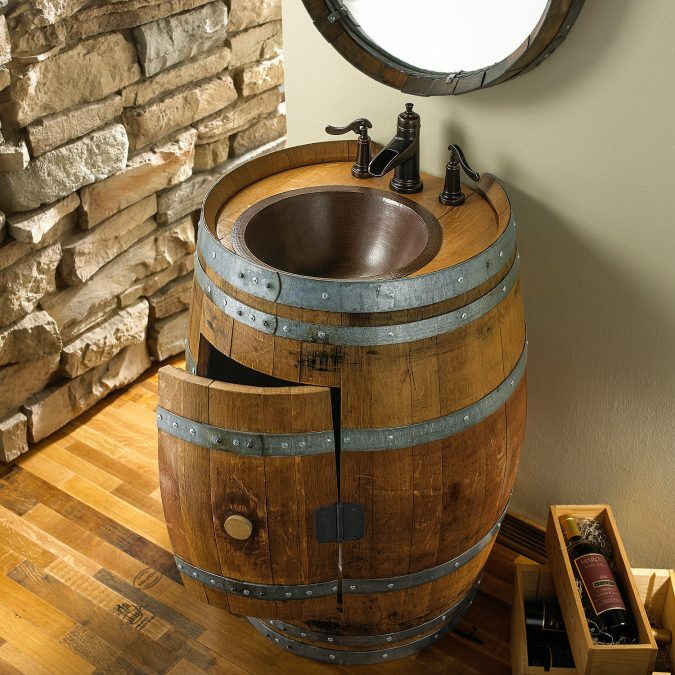 If that is the case, then get yourself a real oak barrel and turn it into an exceptional vanity. However, it is going to require a special care before you get to the step of plopping the sink, so do not rush into doing things if you do not have a previous experience with the drainage system; instead, get some professional help from someone who is able to give you the vanity of your dreams without messing things up. After the sink is installed, make an opening in the barrel where you can place some storage baskets or put your towels in there. If you already have a nice vanity, either in your bedroom or in the bathroom, you can make some simple changes without having to entirely change the furniture pieces. Well, get yourself some paint and a paintbrush that are proper for painting furniture and give your vanity a shot of a new glowing color. If you are afraid that you may mess up the painting process, then ditch it and choose the alternative; patterned sticky papers. You can get them from any crafts store; pick up the colors and patterns that you prefer and then cut the papers into sizes that perfectly fit your vanity. You can also upgrade the curtain and the rug to cope with the whole design. Dining tables are important, but if you are no longer using yours, then recycle it into a vanity that looks brilliant and remarkable. Well, turning your dining table into a vanity is an easy project; you just need to place the table against the wall and install a faucet in it, besides, you might already have a mirror hanging on the wall, so you are already half way there. 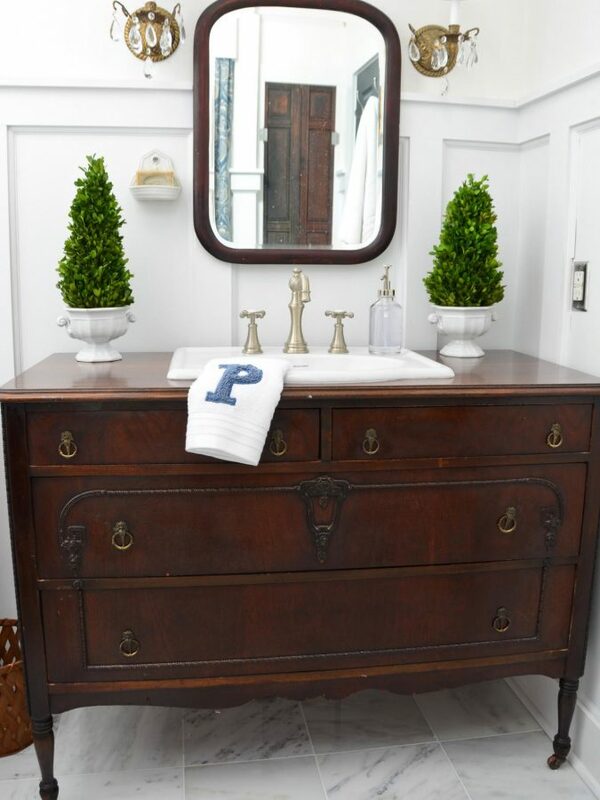 Looking at this piece of vanity, you will find an elegantly vintage piece of furniture and you will hardly notice that it was formerly a marvelous dresser. 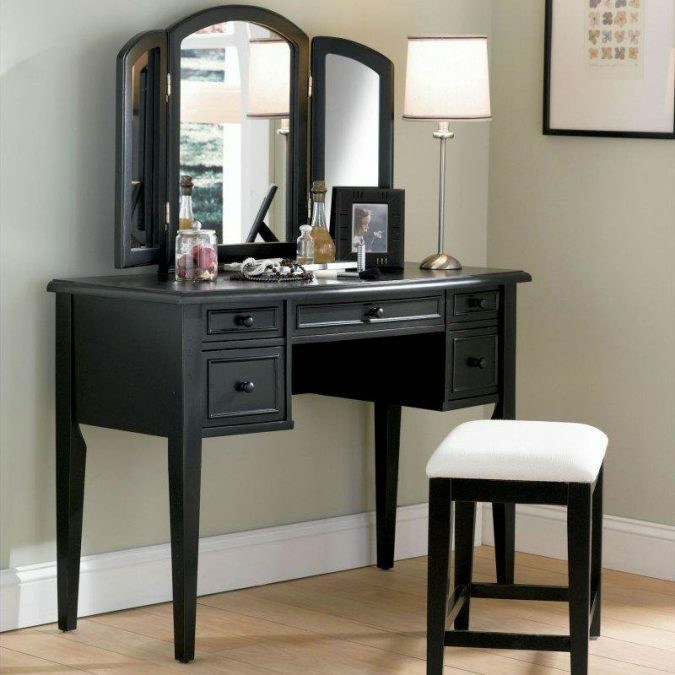 You can make use of your dresser all the same if you are willing to have a new vanity in your bathroom. You will just have to set a room for the plumbing and the drainage system, and there you go. You do not have to purchase a mighty vanity to make your bathroom look elegant; in fact, you can use some customized vanities that can even fit the relatively small spaces. You can install a vessel sink that will add a modernized brush to your bathroom. 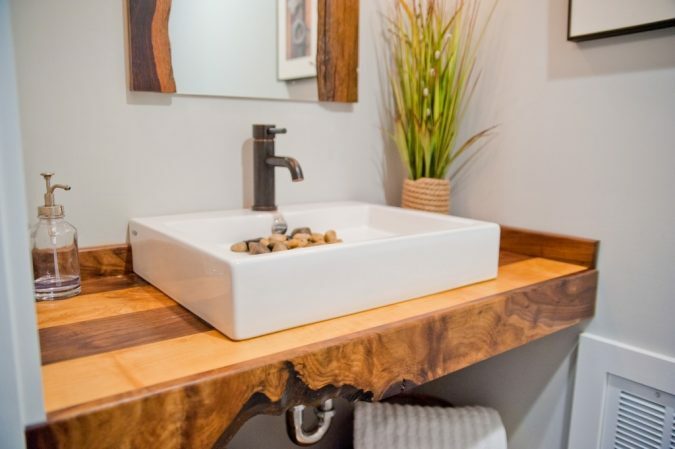 Do not pressure yourself too much when it comes to purchasing a new vanity, you can use these ideas in order to recycle and make use of the old stuff instead of spending a fortune and messing up your budget. 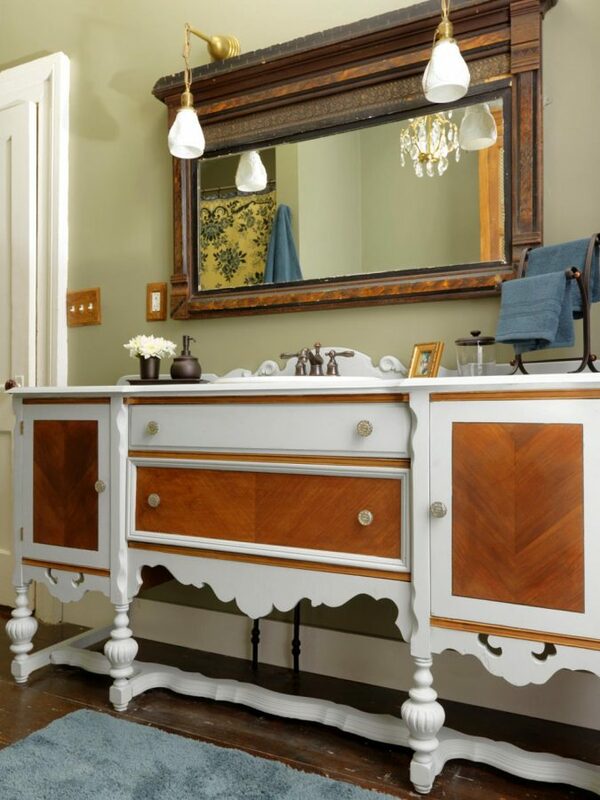 Get started now and upgrade your interior design with some beautiful vanities.